This week is Bluestocking Week, a week of festivities held to recognize and celebrate the participation and achievements of women in higher education. Much of the progress made by and for women in terms of access to a university education can be attributed to the birth of women’s studies in the late ‘60s-‘70s, which actively carved out a space for women within the previously male domain of academia. Since then, academic women have been demanding to be taken seriously, regardless of their field, some to greater avail than others. Recently the University of Queensland announced that as of 2014, gender studies would no longer be available as a major. This comes as disheartening news in light of the announcement that Australian universities will undergo serious funding cuts in order to facilitate the Government’s proposed education reforms. According to Fred D’Agostino, the executive Dean of Arts at UQ, the decision to cut gender studies was due to ‘low demand for the major.’ In times of budget cuts and school structure reforms, it is the small disciplines like gender studies that are the first to go. The discontinuation of these smaller, yet no less important, areas of study clearly indicate which kinds of knowledge and expertise are valued in our society. I am in my final year of a gender studies major at the University of Tasmania. When I tell people I am majoring in gender studies I am usually met with confusion or belittling amusement. ‘You’re not one of those man-hating feminists are you? !’ ‘Men are discriminated against TOO, you know?’ ‘But what are you going to do with your life REALLY?’ These are just some of the reactions that have lead me to sometimes just say I’m majoring in sociology to make it less confronting and easier for people to understand and accept. But this is not ok. I’m proud of my degree and believe it has legitimate and intrinsic value. Studying gender has changed the way I think about and experience the world, it has changed my relationships and it has changed my life. If that is the result after just a few years of undergraduate study, imagine what it could do for more people if it were more widely accepted and respected as a discipline. 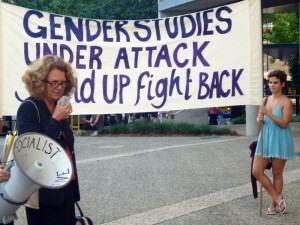 At UQ the gender studies program is now being ‘taught out’ as a separate discipline, but aspects of gender studies will still be taught through other subjects and these could be used to complete a gender studies major. However, there are problems for students who wish to pursue Honours in gender studies, which has not been offered at UQ since 2005, causing students to have to move interstate if they wish to do Honours in gender. At UTAS I have experienced these kinds of problems first hand in that the gender studies department is so small that majoring in the subject is difficult in terms of gaining the requisite number of units to complete a major. Downsizing and school restructures have caused me to have to scrape together units from other disciplines like sociology just to complete the course I want to specialize in. Next year I will be doing Honours in sociology because I am concerned that the Honours program for gender will not get me where I need to go. According to Professor Carol Ferrier at UQ ‘up to a third of the research higher degree thesis students are doing topics in the area of gender or women’s studies in many parts of UQ, especially humanities and social sciences.’ This indicates that the relevance of gender relations in society and the demand for gender as a subject is not low. When a subject is perceived as poorly facilitated, lacking in choice and devoid of opportunities, enrollments will decline. In first year I changed my major from philosophy to gender studies because I could not live with the fear of graduating from an abstract degree with little clear job prospects or relevance to every day life. (I also couldn’t stand the overrepresentation of cocky 19-year-old undergrad boys who studied Plato, Descartes and Nietzsche and thought their own opinions were the best thing since, well, Plato, Descartes and Nietzsche). I am concerned for the future of gender studies programs, not just in my own university, but also in universities all across Australia. The discontinuation of gender studies programs is ominous at a time when we need in-depth studies in gender the most. As we are living in times where we need to be more compassionate to others and more thoughtful about the world in which we live, we need disciplines like gender studies for us to be able to see the way into, what at times can seem like, a dark future ahead. Having done an introductory Genders Studies course as an elective last year as part of my Commerce degree, this is making me feel so sad. I LOVED it and it was a defining time for me, really hitting home to me about the big issues in society, not just surrounding women, but regarding other marginalised groups. People don’t realise it’s a tool for learning about racism, homophobia, transphobia, ableism etc etc it made me so much more open minded and accepting person. I still have some electives left in my degree so I fully plan to take advantage of these subjects before they disappear. UQ has such a rich history in Women’s and Gender Studies, this is truly awful. This entry was posted in Culture, Featured, News, Opinion and tagged feminism, gender, gender studies, university, university of queensland. Bookmark the permalink.